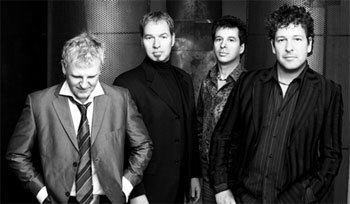 In 2005 Glass Tiger marked 20 years of making music. In celebration of this achievement, EMI Music released a retrospective DVD containing all of the original hit videos the band released in the 1980's and 90's along with 2 new videos and songs recorded especially for the DVD compilation. In addition to the DVD, a new "Best Of" CD with all your favorite GT hit songs and two new tracks is available in stores. Both are also available online at Shop GT. As part of the celebration GT will be continuing to tour across Canada in 2006. Check the "Upcoming Gigs" regularly for updated info on live show dates. Glass Tiger has no plans to stop touring or recording anytime soon, but there's no doubt the upcoming gigs will be something special. If you've never seen a GT live show, this will be your chance to experience in person why GT has been one of Canada's most enduring bands for two decades. Fans who have enjoyed seeing the band live over the years say they are better now than ever. Here's your chance to find out for yourself. Noteable Entertainment & Events is a Vancouver based booking agency, party rental, entertainment services and event production company. If you are interested in booking Glass Tiger please contact us.